Dairy operations vary, and each operation presents its own unique problems (fig. 9-3). Many older dairy operations were not designed with sufficient consideration given to waste management. As a result, the design of a waste management system may require major modifications or alterations of existing facilities. The dairy industry generally is concerned with the overall appearance of the dairy farms. Dairy operations require high standards of sanitation and must prevent problems associated with flies. Operations near urban areas must manage the waste in a manner that minimizes odors. Dairy animals are typically managed on pastures in partial confinement. While animals are on pasture, their waste should not be a resource concern if stocking rates are not excessive, grazing is evenly distributed, manure from other sources is not applied, and grazing is not allowed during rainy periods when the soils are saturated. 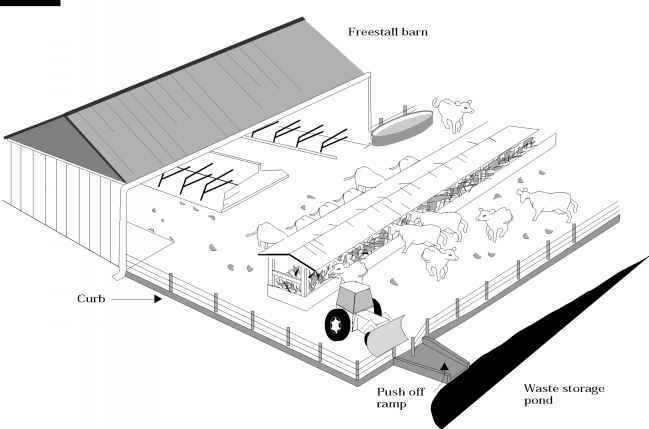 To prevent waste from accumulating in feeding, watering, and shade areas, the feeding facilities can be moved, the number of watering facilities can be increased, and the livestock can be rotated between pastures. 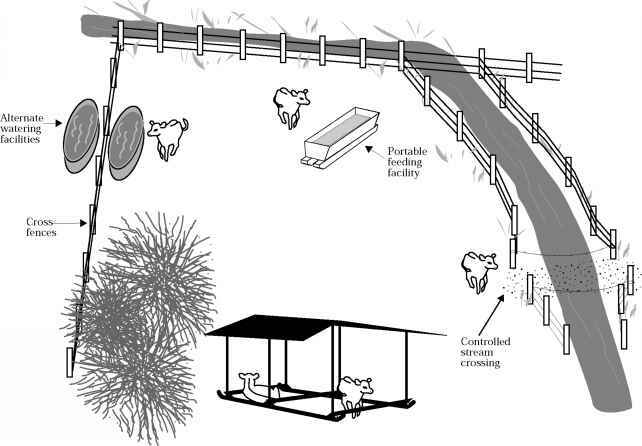 To reduce deposition of waste in streambeds, access to the stream may be restricted to stable stream crossings and access points (fig. 9-4). The manure in paved holding areas generally is easier to manage, and the areas are easier to keep clean. If the holding areas are unpaved, the traffic of the livestock tends to form a seal on the soil that prevents the downward movement of contaminated water. Care must be taken when removing manure from these lots so that damage to this seal is minimized. Waste associated with dairy operations include manure, contaminated runoff, milking house waste, bedding, and spilled feed. 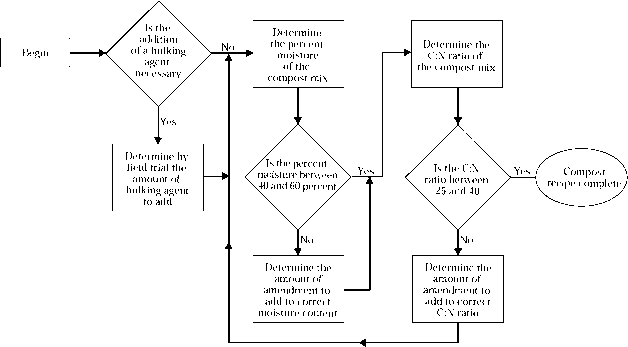 The collection methods for dairy waste vary depending on the management of the dairy operation. Dairy animals may be partly, totally, or seasonally confined. Manure accumulates in confinement areas and in areas where the dairy animals are concentrated before and after milking. Unroofed confinement areas must have a system for collecting and confining contaminated runoff. This can be accomplished by using curbs at the edge of the paved lots (fig. 9-5) and reception pits where the runoff exits the lots. Paved lots generally produce more runoff than unpaved lots. On unpaved lots, the runoff may be controlled by diversions, sediment basins, and underground outlets. The volume of runoff can be reduced by limiting the size of the confinement area, and uncontaminated runoff can be diverted if a roof runoff management system and diversions are used. 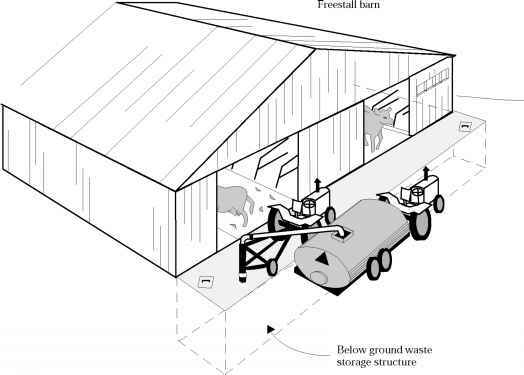 The manure and associated bedding accumulated in roofed confinement areas can be collected and stored as a solid. The manure can also be collected as a solid in unroofed lots in humid climates where the manure is removed daily and in unroofed lots in dry climates. Manure can be removed from paved areas by a flushing system. The volume of contaminated water produced by the system can be greatly reduced if provisions are made to recycle the flush water. 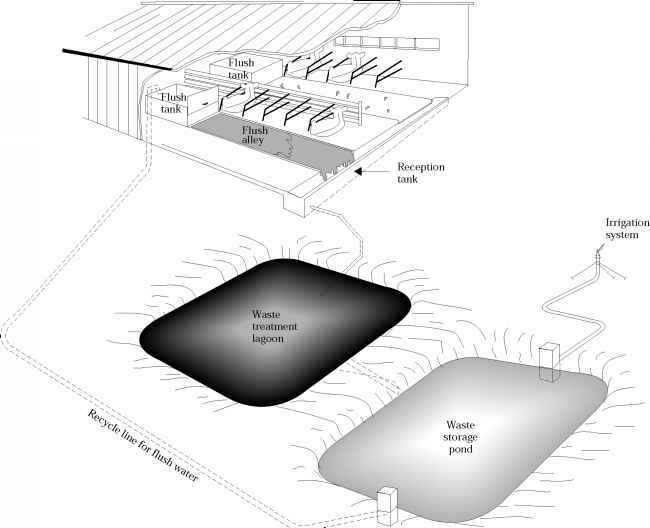 Milking house waste and contaminated runoff must be stored as a liquid in a waste storage pond or structure. Manure may be stored as a slurry or liquid in a waste storage pond designed for that purpose or in a structural tank (figs. 9-6 & 9-7). It can be stored as a semisolid in an unroofed structure that allows for the drainage of excess water and runoff or as a solid in a dry stacking facility. In humid areas the stacking facility should have a roof. Liquid waste can be treated in an aerobic lagoon, an anaerobic lagoon, or other suitable liquid waste treatment facilities. 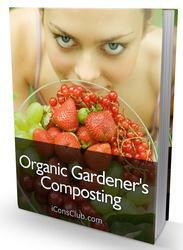 Solids in the waste can be composted. The method used to transfer the waste depends largely on the consistency of the waste. Liquid and slurry wastes can be transferred through open channels, pipes, or in a portable liquid tank (fig. 9-8). Pumps can be used to transfer liquid waste as needed. Solid and semi-solid waste can be transferred by mechanical conveyance equipment, in solid manure spreaders, and by pushing them down curbed concrete alleys. Semi-solid waste has been transferred in large pipes through the use of gravity, piston pumps, or air pressure. 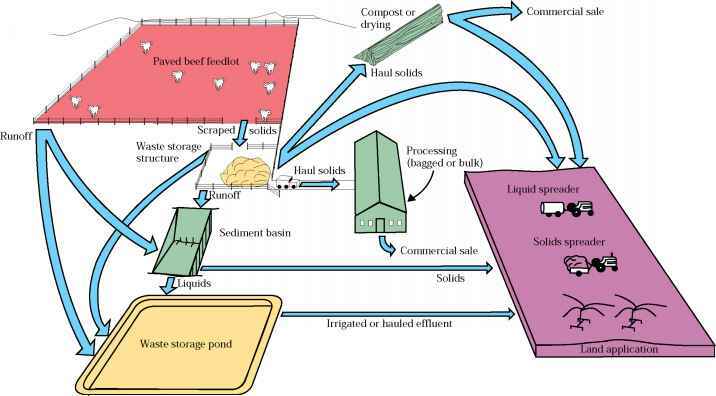 Dairy waste is used as bedding for livestock, marketed as compost, and used as an energy source, but the most common form of utilization is through land application. Waste may be hauled and distributed over the land in a dry or liquid manure spreader. Liquid waste can be distributed through an irrigation system. Slurries may be distributed through an irrigation system equipped with nozzles that have a large opening (fig. 9-9). How do farmers design a waste management system in Dairy Units? What to consider when designing a waste management system in a dairy unit? 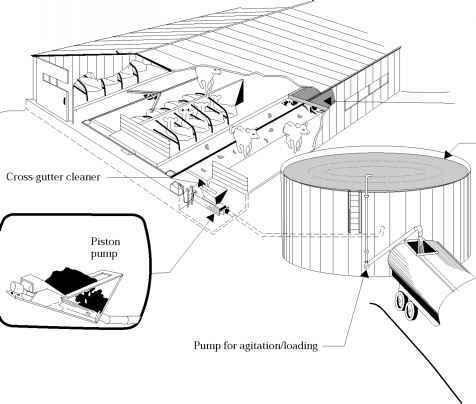 What should dairy farmers consider in siting a dairy waste unit?